Thanks to Generation UCAN for their support in my R2R2R training! Only 4.5 weeks left until my R2R2R journey and I am getting super excited already! The weather has been changing in Colorado to cool mornings and lower daytime temps with snow on the ground (don’t worry, it will be gone tomorrow! ), which makes for awesome running conditions! This is my MOST favorite time of the year to be on trails and this past week did not disappoint! Remember, when I mentioned my knees were hurting a bit in the previous weeks? Well, no more and for no other reason that I reduced my overall running miles. Not by much but just enough for my knees to be happier. The amazing Fall colors will soon be gone but for now, they are awesome! A bit of snow at 7000 feet! Total running miles came in at 42.9 (about 5 less than last week), TSS was 550 (about the same from last week) and elevation gain was 4469 feet. Overall, it was a solid week. Recovery was spot on as I focused mostly on consistent use of iKOR CBD oil, Trigger Point Grid and the ORB for myofascial release, Modus Nutrition protein powder, Birota Foods Smart Cocoa and Generation UCAN Plain energy powder and cinnamon energy bars. I have discount codes for all of these if you ever want to try them. Just email me. 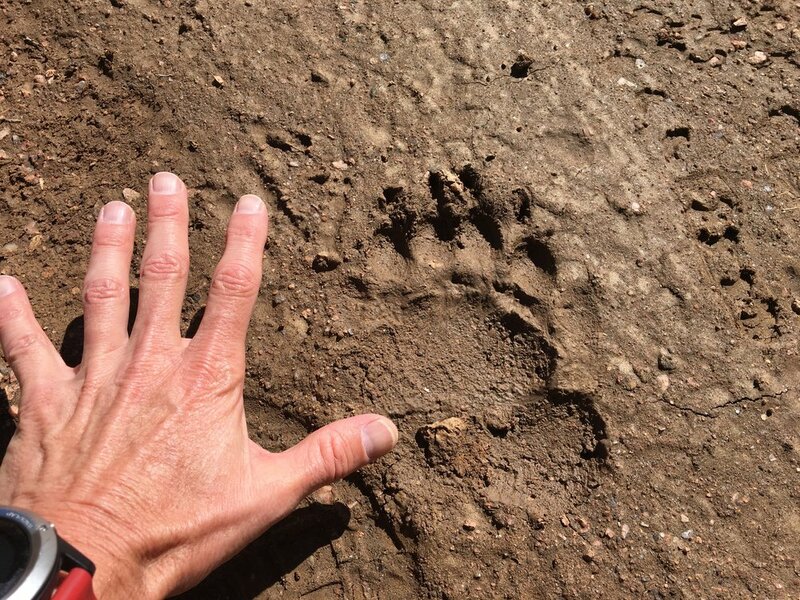 No bear sightings on my long run this week, only fresh bear tracks. Long run nutrition has been going very well lately as I have been using UCAN powder and cinnamon bars but I thought I would try something new before I enter the 4 week countdown. This past week on my long run I took two bottles - one with water and Birota Foods Smart Cocoa and one with water and Modus Nutrition protein powder. I just wanted to see what would happen, specifically to my energy level and digestive system. Neither products are really intended to use during exercise but I did have a theory about both. The Smart Cocoa contains little carbohydrate per serving but has MCT’s from organic coconut milk powder and caprylic acid. If you have been keeping up with my social media, you noticed my ketone experiment I did after drinking Smart Cocoa (ketones increased which put my body into more of a fat burning mode). MCT’s are also stored and utilized very differently from other, long chain fats so I postulated that I would have immediate energy after consuming Smart Cocoa. Long run nutrition: Birota Foods Smart Cocoa, Modus Nutrition plant based protein powder and Generation UCAN Cinnamon energy bar. I did with absolutely no GI distress at all. In the weeks prior, I have mixed Smart Cocoa with plain UCAN powder for a double whammy in terms of energy so at this point, I know both work well on their own or mixed together. I believe these will be a great part of my R2R2R nutrition plan! The second experiment was with Modus Nutrition plant based protein powder. Because the protein sources are from potato, cranberry and pumpkin seeds, there are carbohydrates in addition to protein and fat so my theory was that it would provide good energy and somewhat longer lasting. It worked well but I think it was a bit too much protein. I did not have GI distress but my gut felt a bit “heavy” for about 20 minutes after drinking it. For now, I will use Modus Nutrition protein powder more for what it was intended for - before and after exercise to aid in optimal net protein synthesis. You know what I will be having before and after my R2R2R, right? We had some snow today which makes the trails sloppy. I like to respect the trails as much as I can so I am going to stay off of them for the next few days until they dry out and venture out for another 20 or so mile long run toward the end of the week. I have found that this mileage for my long runs are my sweet spot where I can recover quick and not beat up my body too much. My goals this week are similar to this past week since my body is feeling pretty darn good. Get consistent sleep and focus on daily nutrition (metabolic efficiency), keep my recovery practices as top priority, keep running miles a bit lower and keep the strength and cross training in the picture.